One more step along the world I go...: What a week! As I've mentioned before, I am living in the Dutch Reformed Church compound. There were two things the pastor warned me about before letting me the garden cottage: firstly the absence of a door on the bathroom (I live so this doesn't bother me unduly) and secondly the monthly market. On the last Saturday of every month the church grounds host, what was described to me, as a craft market. Now, having been raised in a small Derbyshire village I was expecting something akin to our local church or WI fair i.e. a few trestle tables with homemade cakes and tea, a craft table and maybe 20-30 visitors at a time. How wrong could I be! The church market was huge. At a guess I'd say there were around 150 stalls (?) selling all manner of things: second hand books, jewellery, homemade cakes, tailored clothes, vegetables and fruit, furniture (you could get an entire dining table and chairs if you wanted! ), fabric, carvings, homemade toiletries, paintings...and the list goes on. I wandered for a good hour or more just browsing the stalls. There was also a food section where wonderful smells kept drifting past me....Chinese stir-fry and spring rolls, BBQ chicken, lebanese wraps, cupcakes etc. My boss was at the market with her husband so we got a cup of tea and sat at a table under a shady umbrella just soaking up the atmosphere. It felt terribly civilised and a wonderful way to spend a lazy Saturday morning. Unfortunately I haven't got pictures as I was so busy exploring I forgot to snap away but I will fix that later this month when the market returns. On Sunday I decided to go on a bit of an adventure and explore the wider city. Now, I like walking but as I discovered the previous weekend, Lusaka is quite spread out so an hours walking can still leave you miles from you desired location. As such, I made the bold move of trying out the local transit buses. The buses don't have a timetable or published routes like the UKand they are most certainly not numbered. Essentially, its guesswork to a foreigner such as myself. Over the prior week I'd noticed that, if I was walking along a road, most minibus drivers would parp their horns at me and holla out the window something unintelligible. I guessed that they were trying to find out if I wanted/needed a lift on the minibus and had invariably shaken my head at them to indicate no. However, on Sunday morning, much to their shock I returned their holla with a smile and I was invited on board. I had started walking in the direction of town from Kabulonga (a pretty straight road towards Longacres/Rhodes Park) so I figured the worst that could happen is I ended up further long the same road but I indicated roughly where I was headed, negotiated the price and set about finding a seat. That was the interesting part! Like Nigeria the buses tend to just have benches that you try and perch your bum cheeks on and as more people get on your get more and more squashed along the bench. It is amazing how many people you can fit in those little buses. I considered myself quite lucky as it was early-ish on Sunday morning so there weren't too many passengers and I was seated next to lady in a beautiful African print outfit on her way to church. The bus ride was quite pleasant with the breeze drifting through the window and certainly alot easier than my walk down Los Angeles Boulevard the previous Saturday. I think I did quite well on the bus and ended up close to Acacia Park where I'd been the previous weekend so naturally I popped into Mint Lounge for a food top-up. I couldn't resist the idea of pancakes and so polished off a huge plate of apple & cinnamon pancakes with ice cream -yummy! Who said you have to slum it when you're a volunteer :) Making a packed lunch during the working week means I have money to splurge at the weekends which suits me just fine! After Mint Lounge I walked along Great East Road to Manda Hill shopping centre where I swear half of Lusaka's population was hanging out. It was absolutely heaving with people at lunchtime. It seems quite a weekend past time, hanging about in malls - very odd! I made a quick escape and walked down Addis Ababadrive, through the back streets of RhodesPark to Longacres where I picked up another bus home. It was a long day but I certainly have a better feel of the Eastern side of Lusaka now. Next job is to explore Cairo Road. My working week began with a meeting with Henry, an advisor SunnyMoney have been using to navigate their way through the Zambian tax system. Henry used to work at the Zambian Revenue Authority (ZRA), the equivalent of HMRC for those of you in the United Kingdom, so I had arranged a Monday meeting with him to get a quick 'download' of the key taxes and returns and their due dates for the Financial Calendar I'd started to draft. The best way I can describe my first impression of Henry is that he is a 'wide boy'. He came across as someone who'd know how to 'duck and dive' the bureaucracy and get things done, in short a very useful person to have on our side. It was a bit overwhelming meeting him as he spoke incredibly quickly, almost as though he was trying to catch me out, but I think I got the main points and I quickly realised my first deadline was 1 March - eek - the PAYE annual return! I spent alot of the early part of the week pulling together the various strands of our employment records (payslips, contracts, PAYE monthly returns and receipts) into a single file so I could consolidate our data records and complete the annual return. It was quite a satisfying, if somewhat dusty job, as the pieces of the puzzle were in various files and cabinets but we now have a single source of accessible employment records that match our return -bonus! Luckily there were some nice treats in the office this week to fuel all my activity. Karla, who sits out front with me, is a bit of a baker and made the most amazing cheesecake on Thursday and birthday cake for Angela on Friday. So, before heading off to the ZRA on Friday morning I had a big chunk of chocolate cake for brekkie - bad I know but very very good as well :) I had brought in Steve Wonder's 'Happy Birthday' tune on my iPod so we played that and Angela boogied round the office whilst eating her cake. It was great but I needed to submit our return so so waved goodbye and set off in a taxi, bound for ZRA. The traffic was insane on Great East Road and it took us quite a while to get to ZRA. ZRA is on the Kafue Roundabout which sits at the crossroads of Great East Road (road in from the airport) and Cairo Road (the commercial hub of Lusaka). The ZRA building is concrete monolith that rises up into the sky and is, in of itself, a daunting prospect. I've never liked tax, right from my accountancy exams and my various dealings with HMRC in the UK. 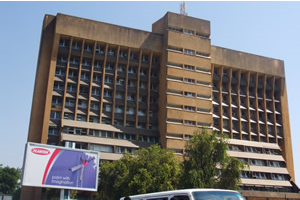 Tax authorities are inevitably bureaucratic and the ZRA was no exception. The taxi dropped me at the entrance gates and I set about trying to work out where to go. There were no signs as I expected. I was momentarily distracted by a man in a midnight blue crushed velvet suit and wincklepicker shoes (amazing sight to be seen when it was a good 35C outside!) but eventually followed the crowd into the Advice Centre. I asked a lady at the welcome desk where I should go to submit the PAYE annual return. She mumbled something about rebased currency which wasn't relevant as the return was pre Jan 2013 so I ended up having to ask other people and hope for the best. I was eventually motioned towards a row of chairs sneaking around the perimeter of a glass walled room. I took a seat at what I thought was the end of the line and was promptly shouted at - this isn't the end, that is. I looked and realised there were a good 150 people in front of me; I sat down and realised it was going to be a long morning. From there on it seemed like I was a participant in a huge game of musical chairs. Every time someone was called to the returns desk everyone would stand up and move along one seat. I kept waiting for someone to remove a seat and leave me as 'odd one out'. There were all sorts of people in line, army officials, Chinese business women, taxi drivers, market stall holders, me, and a man with a Deloitte monogrammed shirt (they get everywhere Deloitte!). The man next to me was there to register his business; I glanced over at the form on his lap and noticed that he'd been asked to sketch out a map of the location of his business. He'd neatly drawn out the position near Cha Cha Cha Road(loved that name) and the 'X' marked the spot where he was going to sit and sell his wares. He didn't plan to have a physical shop, just a trestle table at the side of the road. I admired his honesty as surely noone would ever bother to go and check if he was ever paying taxes. After about an hour and a half and much shuffling along to progress my position in the queue I was called forth to an official desk. She was a vibrant lady with a huge afro hairstyle and red hair band keeping it off her face. I explained our position, handed over the form and with a quick stamp was free - 2 hours of queuing for a 1 minute interaction and stamp - amazing! There was a metre high pile of stamped forms beside her so I worry about where our form may end up and whether it will get lost in the caverns of ZRA but I've got my stamped submission form so we're done for now - phew! My taxi journey back to the office was fun. Lance, my taxi driver and I noticed the Welsh flag (you'd be so proud Lauren!) flying at the British Embassy and so started talking about the British Monarchy and devolution of power to Wales and Scotland. It was really quite surreal and not what I expected to be discussing with a taxi driver in Lusakaon a Friday afternoon but Lance was very well informed and so it passed the time nicely. I returned to the office to find we'd had a power cut. The place was eerily quiet without the hum of computers and fans. Thankfully Musonda had still managed to rustle up our Friday lunch of Nshima using a gas canister so we sat down to enjoy our lunch and wait for the power to return. It really was a most civilised end to the week. A few of us headed out for drinks after work at Miki's bar. I enjoyed a few Mosi beers but unfortunately the mosquitoes also had a good evening and managed to bite me on both thighs and wrist - damn them!! Today I've been chillaxing as my sister would say. I had a lie in, a lazy breakfast and another explore of the local area. I love walking and have been trying to draw up a map of the local area as my Bradt Guide only has the major roads mapped out. The best bit was there were no vehicles passing down the road so it was incredibly quiet and peaceful, so much so that I could hear the buzz of dragonfly wings buzzing overhead. I know there are fun things to do in the centre of town but I do love where I'm staying as it has the balance of being near shops and peace and quiet. I thought you'd have been sporting a full dose of 'jungle juice extra strength' or whatever to keep the mozzies away. Don't the local mozzies know they're not supposed to bite you yet ? I'll expect a recipe book with all the local dishes and cakes when you return and hopefully you can leave a bit of 'wimbledon' cooking behind. I was wearing jungle juice but they just love me. I got the majority of the bites when I ventured to the toilet - typical! Oh golly, no pressure re: recipes.